(Kasey) Hello Mia, What is your role at Inspired by Paper? (Mia) I help cut the bubble wrap, package up the frames, sort out the papers and clean the workroom. The room gets too messy and I have to tell you to clean it. ALL THE TIME. I also get to go shopping with you to buy the papers. I made a list of all the colours to help check which ones you need. I like all the names of the papers. So what do you like about Inspired by Paper? It is fun. I like making all different things. I liked making all the tags with you at Christmas time for the market. What is the favourite piece that Inspired by Paper makes? I love the kids name frames. They always have lots of colours and patterns and themes. Well, what should I do next? What should I look at creating? Something with balloons, oranges or pineapples. What don’t you like about Inspired by Paper? Do I need to pay you more? So you think the workroom is too messy? Yes, it is very messy and lots of things on the floor. You need to vacuum more. So I need to improve on my cleaning? Do you want to keep helping out with Inspired by Paper? Mia is my niece and is 7 years old. 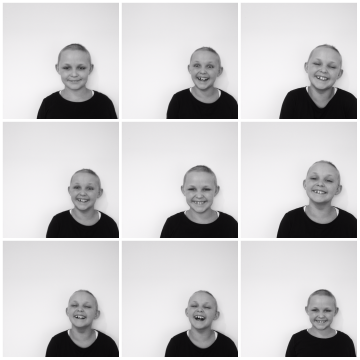 Her current battle with Leukemia has kept her away from school on many days this year. Inspired by Paper headquarters is in the unit next door to Mia’s house so a knock on the door during the day is usually Mia coming over to help or even to have a cuppa tea or lunch with me. I have learnt to relax more with Mia around in the workroom. When I am cutting papers, I use every single corner and ensure there is no waste. When I get Mia to help cut, I use to look away as a lot more was going in the bin and I was freaking out. However I then wondered what the hell I was worrying about, I now just let her go and do what she wants with the paper as there are a lot bigger things to worry about in this world! I love how excited she gets when I ask her to help with things. And even more excited and proud when she gets to work on her own creations. 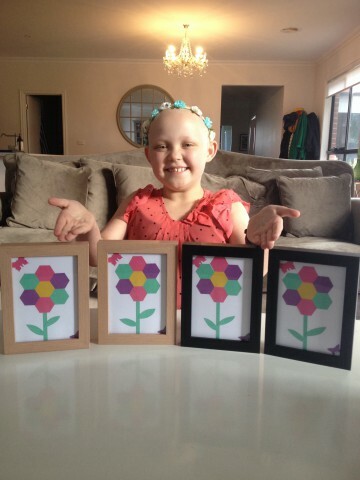 Below are her flower frames she made in April and you can see the happiness in her face. I am still jealous of her and haven’t got over the fact that she sold all four on facebook in less than 5 minutes- I have never managed to do that myself! And I thought I would sneak this photo in…. Sometimes she gets a bit distracted when she helps out. Was suppose to be cutting bubble wrap but there seemed to be something better on the iPad. Luckily I don’t pay by the hour- just the task! Category : Meet the team. ← Market Hit and Miss.